Dead Rising 2 sinks more than it floats. I've got to go to the bathroom. This thought is always on my mind while I hack and splatter my way through the zombie hordes of Dead Rising 2. Only in a bathroom stall — for whatever reason — can I save my game and preserve any weaponry, money and personal skills I’ve managed to acquire. At least the zombies don’t need to use the bathrooms. Whenever I manage to locate a toilet, it’s always miraculously free from the undead that clog every other inch of the world. Somehow, when people are zombified, they instantly multiply until they fill every available inch of space. There didn’t seem to be this many people in the world before they became zombies, but now they’re everywhere. “The world,” in this case, refers to Fortune City. Based on everyone’s accent, I assume it’s somewhere outside of Vancouver. It’s a commercial paradise full of shopping malls, casinos and the shambling undead. The only safe places (aside from bathrooms) are safe houses where un-zombified people gather behind barricaded doors to await the arrival of the military. I was waiting, too, along with my daughter, until I saw a news report blaming me for releasing the zombies on Fortune City. Now, instead of sitting quietly, I must venture out and discover who is trying to frame me. Like the first Dead Rising, I can use almost all of the objects in the game as weapons: park benches, garbage bags, buckets, drills — whatever’s handy. Even better than a bucket or a drill, however, is a “drill bucket,” which I am now able to fabricate thanks to Dead Rising 2’s weapon-creation feature. The handy-dandy drill bucket is a bucket with power drills forced in, which are then switched on when the bucket is slapped over an unsuspecting zombie’s head. Think of it as a wearable blender. Since much of the game is spent bashing through crowds of zombies, these hybrid weapons bring a touch of gory flair to the game’s often monotonous proceedings. Dead Rising 2 has eliminated much of the original game’s fussy multitasking, but I’m still required to keep track an eye on my watch, track down medicine for my daughter and rescue survivors in between bouts of zombie slaughter. And then it’s time to go to the bathroom again. THE GOOD: Rescuing citizens is a bit easier this time through the Rising — they seem to have been given a much-needed intelligence upgrade. They come in all ages and ability levels — from zombie-slow to fighting-quick. Their styles and stories range from sleazeball to dysfunctional to zealous. It’s an interesting mix of fringe characters, and it serves to give Dead Rising 2 some depth and flavor. 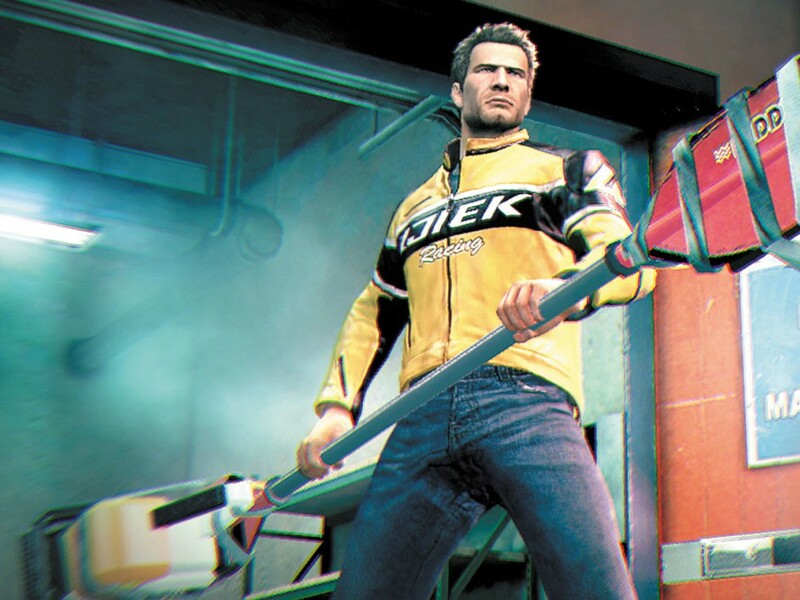 THE BAD: Dead Rising 2 is a clunky but amusing game that makes two unforgivable errors. The first is the aforementioned need to constantly visit bathrooms to save the game. This alone might not have been so annoying if the game didn’t always keep stopping the action in order to load the next room or non-interactive cut-scene. Every time I sat there doing nothing, I started to feel more and more like a zombie myself. THE BOTTOM LINE: Dead Rising 2 sinks more than it floats.